The emergence of pan-African financial groups, the embracing of mobile solutions and a growing middle class are driving gains in banking. As economic growth in Africa has picked up over the past 20 years, access to financial services has improved, leading to growth in commercial banks particularly. The expansion of cross-border banking activities is also changing the banking environment. According to consultancy PwC’s latest African Banking Survey, regulatory oversight and policy reforms have brought improvement. PwC found that the banking industry as a whole showed ‘substantial growth’ in Africa in recent years. South African banks played a large role in this, but Guaranty Trust Bank and Access Bank in Nigeria, and Commercial Bank of Africa and Equity Bank in Kenya are gaining ground fast. This is as more Africans start to save, access credit and even take up insurance products, often through mobile technology. The continent now has fewer systemic banking crises and sub-Saharan African banks are far more stable, demonstrating resilience through the 2008 global financial crisis. Yet there is a long way to go. People living in sub-Saharan Africa are the least likely to have access to banking services globally. 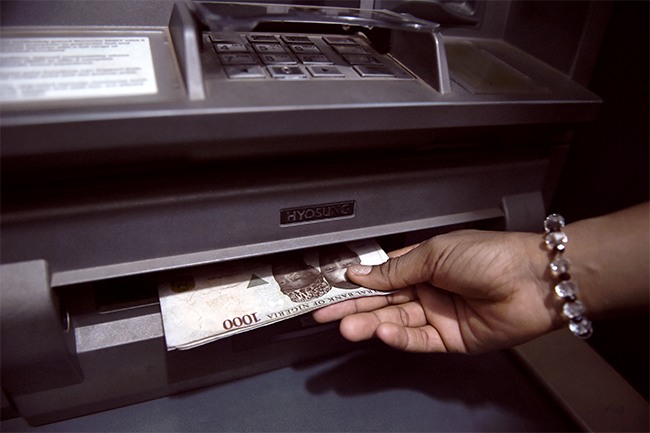 More than two-thirds of adult Africans do not have a bank account. Although the number of commercial bank branches per person is increasing, Africa’s bank branch-to-population ratio is only three to 100 000 – half the level of South Asia. Account penetration has increased by 20% from 2011 to 2014 in sub-Saharan Africa, albeit from a low base. The improvements came particularly from East and Southern Africa, according to a European Investment Bank report. This illustrates how banking access varies notably from country to country. South Africa’s banking sector leads the continent, while Kenya and Nigeria are making good progress. Senegal and Tanzania, on the other hand, have barely any access to banks. Africa’s four largest banks by capitalisation come from South Africa, namely Standard Bank, FirstRand, Barclays Africa and Nedbank. EcoBank, with its head office in Togo, is the fifth largest. Following the global financial crisis, many European and US banks pulled out of Africa to focus on their domestic markets. This created opportunities for African banks to build their pan-African operations. Standard Bank is in 17 countries, Ecobank is in 36 countries while Nigeria’s United Bank is in 19 countries. This regional interconnectivity is expected to shape the future of the African banking industry, says PwC. Standard Bank cut back its global ambitions after 2008, selling assets in Russia, Turkey, Argentina, Brazil and the UK. Instead, it revised its strategy to focus on becoming the leading financial-services organisation in Africa. FirstRand sees Africa ‘as a long-term growth opportunity’, says chairman Laurie Dippenaar in the bank’s 2016 integrated report. The group has operations in eight African countries and, through RMB, corporate and investment banking in Nigeria. The Africa Progress Panel has found that a large majority of Africans do not have bank accounts because, they say, they do not have enough money, the cost of banking is too high, bank branches are often far from their homes, and they lack the necessary documents. Around a third of respondents in the survey said they did not trust banks. High bank fees (often a result of little competition), regulatory hurdles and undeveloped banking infrastructure are a reality in many African countries. In Sierra Leone, for instance, cheque account fees can cost the equivalent of 27% of GDP per capita, according to the Africa Progress Panel. As Africans have rapidly adopted mobile phones, mobile money solutions are seen as the answer to overcoming some of these barriers to banking. The continent accounts for 64% of active mobile money accounts out of 93 countries globally, says the GSMA, a global mobile operator body, in its 2016 the Mobile Economy Africa report. 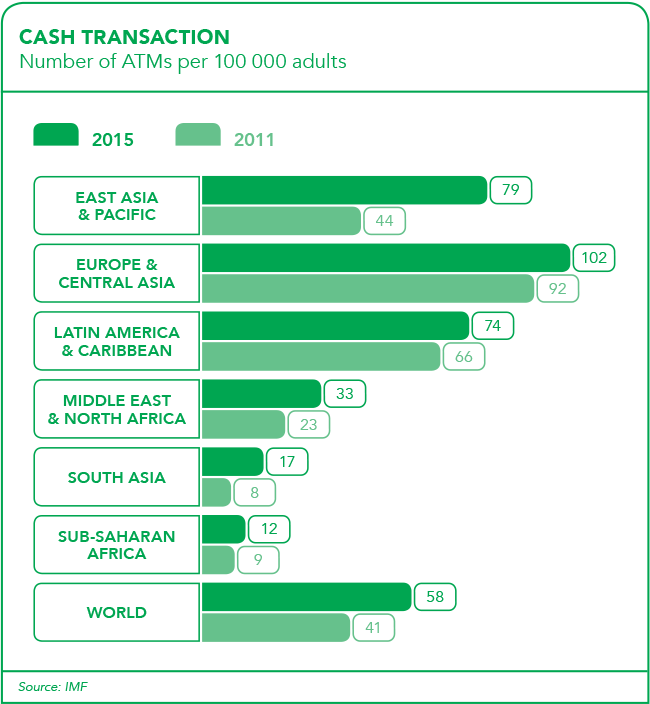 The number of adults with a mobile money account in sub-Saharan Africa rose from 24% in 2011 to 34% in 2014, according to the GSMA. Only 2% of people have a mobile money account globally – in sub-Saharan Africa 12% of adults have access to one, the 2015 World Bank Findex report found. Mobile money provides access to savings and credit – and in some areas, insurance – to people who were previously unable to benefit from formal financial services. The potential of mobile banking is illustrated by the success of Kenya’s M-Pesa, the Safaricom payment platform. 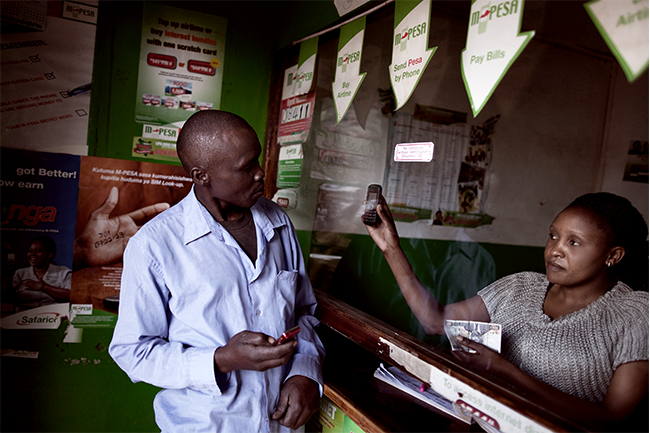 In just six years, 15 million Kenyans used M-Pesa to send and receive money electronically for the first time. A survey found that 86% of Kenyan house–holds had used their mobile phones to make payments or send and receive money, while M-Pesa has more subscribers than Kenya’s top five banks combined. Mobile money is also playing a part in improving efficiency and cutting the costs of sending money across borders, says the GSMA. ‘Using mobile money as both a sending and receiving channel for international money transfers can significantly bring down the cost of remittances for users,’ says the GSMA. As a result, more regulators are realising the importance of creating an enabling environment for mobile money services. Mobile payments, however, have only really taken off in Kenya and South Africa. The African Progress Panel has blamed this on regulatory failure in other African countries. Mobile banking was successful in Kenya because mobile service providers were allowed to compete with banks, while in many other countries governments have not opened banking systems to competition. Etienne Slabbert, chief information officer for Barclays Africa regional management, says ‘opening up closed systems such as the M-Pesa mobile phone money system is a major focus for our bank and we have launched bank-to-wallet and wallet-to-bank services in most of our markets on the continent’. This is as ‘payments continue to be the driving force across our continent. While cash is still dominant, the shift to digital is becoming more pronounced, driven primarily by e-wallet solutions and offerings like Barclays Africa’s Hello Money, which enables customers to transact digitally – and safely – without having to travel to a branch or merchant in question’. The Africa Progress Panel suggests that if other countries have the same success that Kenya has had with M-Pesa, financial service providers could substantially increase their revenues. Ethiopia and Nigeria, for example, could double their revenues. ‘These findings underline the opportunities that sub-Saharan Africa presents for financial service providers, mobile operators and others seeking new markets,’ the panel says. However, the future of banking in Africa does not only rest on mobile offerings. PwC maintains that banks will diversify across financial services through growing corporate banking, introducing insurance products, and venturing into asset management. Islamic finance is also on the rise, with the industry expecting to triple by 2020 to US$6.5 trillion in assets. More than a quarter of the global Muslim population is found in Africa, yet only 2% of global Islamic banking assets originate there. In particular, there are opportunities for growth in Sukuk issuances for various infrastructure developments, which will boost Africa’s development requirements. The European Investment Bank has found that banking in sub-Saharan Africa has ‘deepened remarkably’ in recent times while access to finance is improving. In addition to an increased uptake in mobile money solutions, blockchain technology and the use of Bitcoin could also potentially disrupt banking in Africa – or further deepen the financial sector’s penetration. Absa was the first African banking group to join the global R3 blockchain consortium. Blockchain – which records cryptocurrency transactions in a digital ledger – has the potential to ‘profoundly’ change financial services, according to Absa, which is part of Barclays Africa. ‘We see huge potential for financial institutions in Africa to embrace disruptive technologies like blockchain, and use them to empower individuals and improve the lives of their customers,’ says Andrew Baker, chief information officer for corporate and investment banking at Barclays Africa. Blockchain could potentially benefit trade flows in Africa. As Africa’s middle class continues to grow, and the overall population expands – coupled with the trend towards urbanisation – demand for financial services will continue to increase. This can lead to two outcomes. On the current trajectory, where urbanisation in Africa is not leading to progress due to the lack of infrastructure, the continent could end up with water and power-supply shortages and congestion. In the second scenario, banks could help channel funds towards sustainable infrastructure projects, encourage responsible lending and promote ethical investing, argues PwC. If the second scenario becomes reality, the future of banking in Africa would look even more promising.